Angels and Devils: Who spilled the wine? Angels and Devils, one of my newest paintings, is just about finished . But before I apply two coats or vanish and attach a hanging wire I’ve got to decide who the angels and devils are. The painting depicts Fredog, my sister’s black lab, and my two cats, Mylo and Livee. From the looks of it they have thrown a party and broken into a bottle of Devil Dog Red Wine — and someone has spilled the wine. Of course they all have angelic looks on their faces and no one is talking — so who did it? The halos and devil horns are made out of polymer clay and are not attached yet, so I think I’ll have a little fun shifting the blame, and the horns, around to each of them. Through the wonders of digital imagining I can produce archival ink prints of the image exposing each of them as the wine spilling culprit — but the halos and horns will have to be permanently attached to the original. So tell me — who do you think did it? 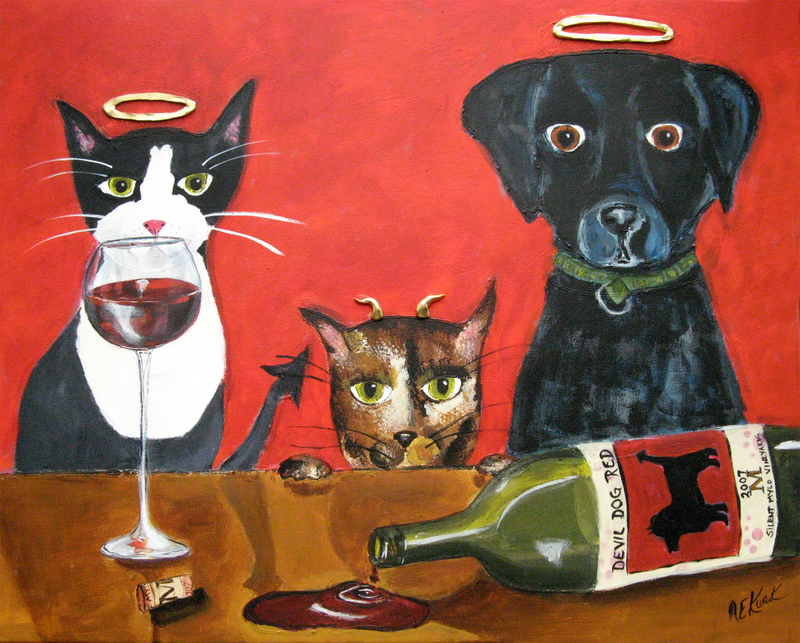 This entry was posted in My Art Work, My Etsy Shop, My Life and tagged Alison E. Kurek, Alison Kurek, angels, black dog, black lab, Buffalo New York, cat, devils, ETSY, Fun Art, funny art, halo, horns, mixed media, My Art Work, original animal art, painting, pets, Silent Mylo Tuxedo Cat, silentmylostudio.etsy.com, tortie cat, tuxedo cat by Alison. Bookmark the permalink.